We at ST minibus hire do a lot of trips to Manchester city football club. They play at the Etihad stadium, they moved here from Maine road in 2003, They changed the name from Eastland’s to Etihad when they received a new sponsorship deal . Generally when they play and win a lot of city’s fans sing the fan anthem Blue moon, in reference to the home colours worn by their team. 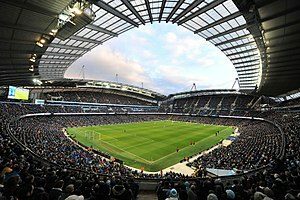 The Etihad stadium can hold 48,000 fans at present but word on the street is they are looking at ways to increase this to 60,000. Manchester city have two crazy mascots who are aliens named Manchester and Moonbeam. The stadium host tours daily, and the tour takes you to see the club museum and the city sports bar. As well as being one of the famous Football grounds in the premier league the Etihad stadium also host a variety of concerts. Over the years Take That, Bon Jovi, Muse, Robbie Williams, king of leon and in 2014 they welcoming pop heart throbs one direction. Before it became the home of Manchester city’s football team the stadium was built for the commonwealth games in 2002. Another venue used during the commonwealth games the velodrome, now known as the national cycling centre. The velodrome can hold 3500 people and has one of the fastest board tracks. The velodrome sees all level of cyclists and actively encourages people to develop an improve their skills, during the school holidays there is a school held for 9-16 year olds I’m sure anybody would agree this will be an amazing opportunity to keep the kids occupied and out of trouble during the long summer break . The velodrome is in demand for small and medium conferences, corporate events, trade exhibitions and board meetings due to its fantastic location and facilities. The velodrome is not only home to cycling it also has basketball, Netball and Badminton played here. You can become a VIP for the night with diner, drinks and trackside seats watching the pro riders. 2014 also sees the Manchester beer and cider festival being hosted here. April 2014 will see the first round of the BMX super cross world cup coming to the velodrome before it goes to 3 other continents. The Aquatics centre was built purposely for the commonwealth games, it is now the home to Manchester university canoe club, the university swimming cub, the city of Manchester water polo club and the city of Manchester aquatics swim team. The aquatics centre has some impressive diving boards and is often used for local gala events, due to its impressive facilities. Trips to this area of Manchester come under our minimum fair from the city centre this is £30 for a 8 seater minibus £40 for a 14 seater minibus and £45 for a 16 seater minibus if you are visiting here and want to book your Minibus the feel free to contact us.